No, that’s not a typo. Today I was Operating Without A List. Not normal for me on a Sunday, the day I spend getting ready for my week every week. I hope I haven’t forgotten anything. I got food cooked and lunches packed, snacks ready and food for dinner this week. I’m only going to work for two days this week, so that really helped. Starting Wednesday I’m off, and leaving for HoopPath on Thursday. I’m very, very ready for that. I also binge-watched the entire season 3 of Orphan Black this weekend. Yeah. SO ready for season 4. Just set my Google alert. Because I’m not always up on when things happen, you know? 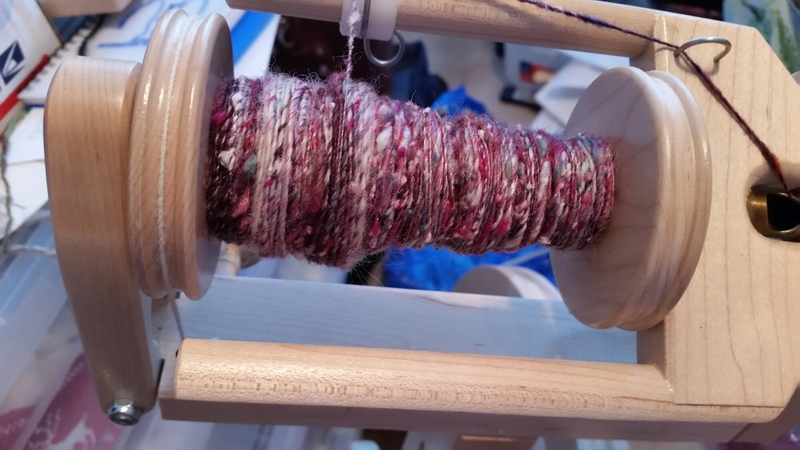 I also spun – yesterday I plied the woolen-spun fiber from last week, and today started on a silk art batt that I bought at SAFF last year. It’s turning out quite lovely. This entry was posted in Art, Fiber, Life and tagged Healthy eating, Honesty, Real Food, Self-care, silk, Spinning. Bookmark the permalink.